Bally Mortuary Systems support good practice and profitability. We worked with funeral directors to design systems that meet the unique needs of a funeral homes, hospitals, EMS centers, and morgues. The coolers provide increased operational flexibility which decreases overall costs. Bally Mortuary Systems give funeral home directors more flexibility to meet the scheduling requirements of the bereaved. 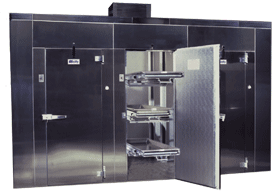 A Bally Mortuary Cooler is cost-effective to have in any funeral home: if the body can be stored under refrigeration, embalming may not be required in certain circumstances. Bally's research among funeral home directors revealed that requests for private grave side funerals (those without public viewings) are on the rise. The desire among consumers to lower funeral costs is resulting in a significantly higher demand for cremation. 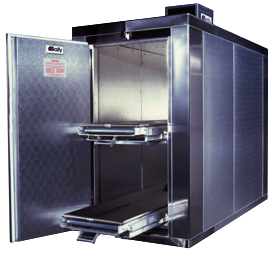 In either case, a Bally Mortuary Cooler allows greater flexibility for both the bereaved and the funeral home. experience to create the flexibility of on-location refrigeration. Bally Mortuary Systems are available in standard 1-9 body models, with custom configurations also available. Our standard heights range from 5'9" to 8'6" plus casters. 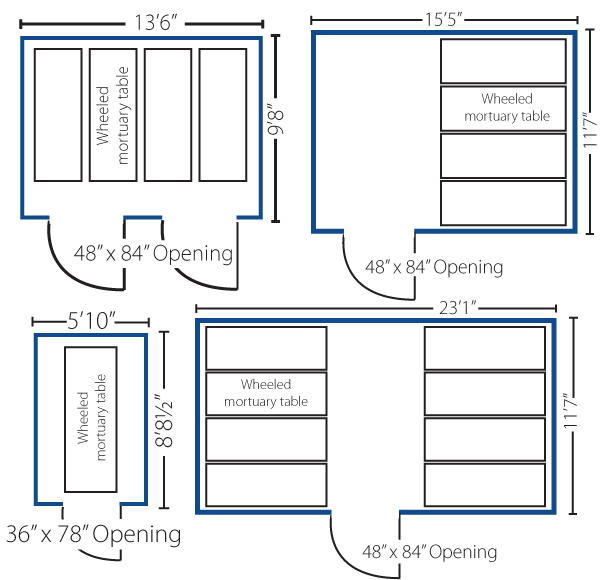 Each layout contains enough space to easily maneuver wheeled tables. Systems come equipped with heavy duty aluminum or stainless steel slide out trays, which are easily removed to accommodate gurneys or caskets.